Using photos from your albums on modelflying.co.uk is probably the easiest way to add photos to forum posts. To make an album and add photos to it see Steves great tutorial here. Step 2 In the thread where you want to put the photo, click the camera shaped button. Step 3 This brings up a list of your albums. If you click one, you should see a list of photos appear in the next column. Click one of those and a thumbnail of it should appear in the right hand column. Step 4 Once you've chosen the correct photo, click OK and hey presto - the picture should be in the thread. One other thing that would help, please put multiple photos one above the other with a space in between. We've had some where the browser assumes they are side by side, and it shoves the pictures under the right hand ads. Tryed that but in my photos I have 2 albums one is the one I need, but when I click on the camera shaped button only one album shows and it's not the one i need. I just created this album do I need to wait? Is it still showing only one album? ps Great stuff - wish they were all that easy! This has happened on both occasions when I have transferred album photos to a thread;- the photos appear in reverse order to the one in which I inserted them, so my storyline is back to front and all my efforts are deconstructed, so to speak. what am I doing wrong ? 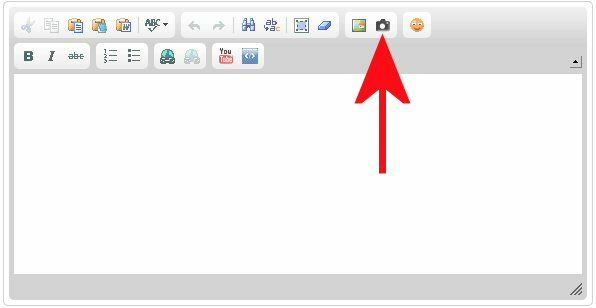 Hi, you are probably lefting the insetion cursor before the picture you have just inserted - so the new one goes above it. If you move your mouse to the lower left hand corner of the picture you have just inseted, then two two carriage returns to create a space between pictures, then insert your next picture you should be fine. I do as BEB suggests but sometimes it's me that's put the photos in the wrong order. If that happens then the photo can be dragged & dropped into the right place - remember to make sure there is an empty line above and below afterwards though (otherwise it can mess up the page layout). It is a shame we cannot have a better browse/insert faciltity in the album. I often need to quickly insert a pic from a Spitfire blog from a couple of years ago. 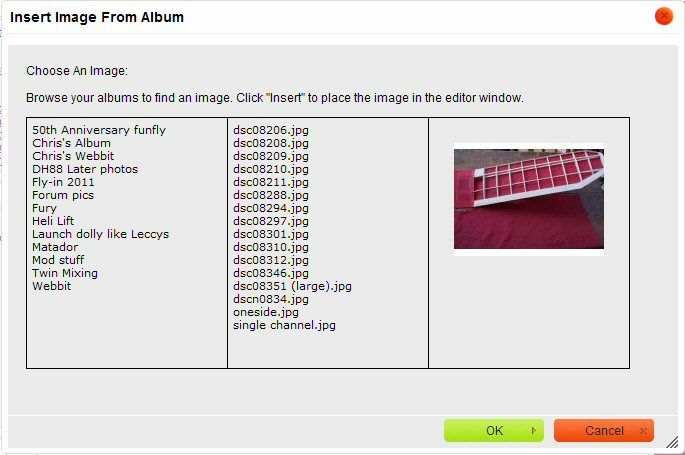 I know the pic is there and often have to "view the album" to find the picture number, before then using the insert function, as the insert function lists them all by name. A shame we cannot insert the pics from the album view screen? I am new to the forum and am having to learn some of the tricks from scratch. My BIG problem is getting photos to upload into an album. I have created an album and I see a column of "browse" boxes to put in photos. I have done that so that two or three boxes have pic numbers alongside. They are all jpg format. Everytime I press the upload button it takes a l o n g time to resolve and finally I get a message that reads "Sorry, the website has an error and the page you requested cannot be displayed at this time. Please try again later." Please help me someone. What am I doing wrong? I don't think you are doing anything wrong as such. That's sometimes happened to me as well. I think if the images you are trying to upload are of a massive file size then this can sometimes cause the upload to fail. If it happens to me I just upload one or 2 pics at a time rather than fill all of the boxes. It sounds likely that each of your photos has a large file size. I find image resizer very useful to make smaller copies of my photos before I upload them. Once installed, when I look in a folder full of photo files, there's an extra option available in the dropdown that appears when I right click on a photo. "Resize Pictures" is now an option. Craig's right, David. I'd suggest resizing your pics to something like 1200 x 800 pixels and uploading no more than three at a time if you have a fairly slow internet connection. As Chris mentions in the first post on this thread, have a read of Steve's tutorial where there is a more detailed explanation of the process. Thanks for the image resizer link Chris, very useful. Many thanks both Graig and Chris. I downloaded the Image resizer program but also found the file resizer option on the right click of the mouse. I'll see if it works. It works - and it was under my nose the whole time. duh! I right clicked over the image and selected medium. I tried the small size but that pixilated the image too much. The medium size reduced the image size from 3.5 Mb to 250 kb. So thanks again - we're in business. It's a shame you have to put pictures in the albums first and then onto a thread/posting. I haven't found a way to put a picture from my laptop straight onto a thread. Easy once you get used to it. 15 articles Is there a problem if trying to insert an album image into a thread whilst using Android phones - cos I dont seem to see an insert / attach option when trying ? I just had a check - On my Android Samsung phone - I can only see a box to type in, but not the lines of buttons above. However on an Android Nexus 7 Tablet, it all looks just like it does on the PC. i.e. all buttons visible. It seems the platform has not yet been optimised for smartphones then ?